WASHINGTON, May 1, 2018 — The U.S. Department of Agriculture (USDA) has designated Delta and Montrose counties in Colorado as primary natural disaster areas due to losses and damages caused by a recent drought. Farmers and ranchers in the contiguous counties of Gunnison, Mesa, Ouray and San Miguel in Colorado also qualify for natural disaster assistance. 05-01-18 Make plans to attend ASTA’s New Policy & Leadership Development Conference June 9-13 in Washington D.C.
Make plans to attend ASTA’s New Policy & Leadership Development Conference June 9-13 in Washington D.C.
WEST LAFAYETTE, Ind. 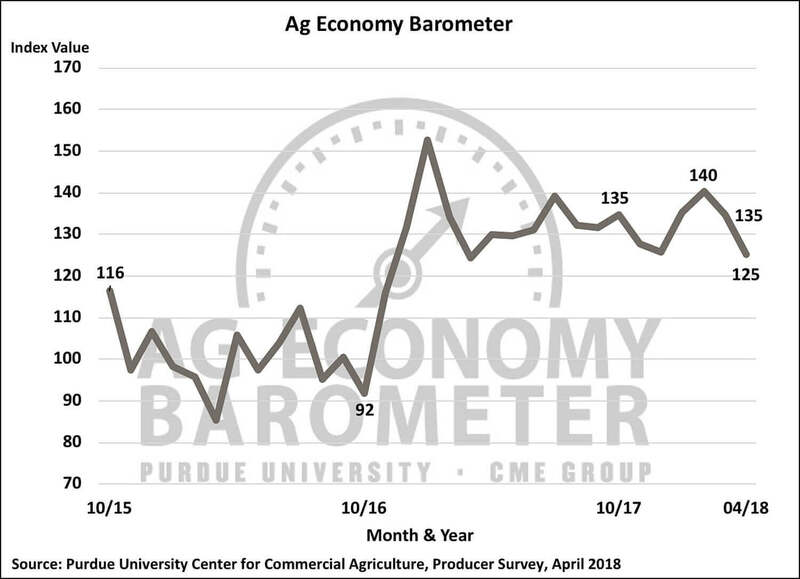 and CHICAGO, May 1, 2018 /PRNewswire/ — Trade war concerns continue to drive a sharp decline in producer sentiment toward the agricultural economy, according to the Purdue University/CME Group Ag Economy Barometer. The April barometer reading of 125 was 10 points lower than a month earlier and 15 points below the February reading. The barometer is based on a monthly survey of 400 agricultural producers from across the country. Negotiations for revamping the North American Free Trade Agreement will continue next week as all sides remain hopeful to reach a deal this month. Top-level talks, according to reports, will continue after a U.S. trade delegation returns from China. U.S. officials and negotiators from Canada and Mexico have been eying an early May finish line, and in mid-April, Vice President Mike Pence said it was a “real possibility” an agreement could be reached in the next several weeks. However, just between Canada and the U.S., issues like dairy, dispute-resolution mechanisms, a proposed five-year sunset clause, and intellectual property remain unresolved, according to The Canadian Press. Still, all sides appear positive an agreement will be reached soon. The Trans-Pacific Partnership continues to move forward without the United States. Mexico last week ratified the new TPP agreement, now called the Comprehensive and Progressive Agreement for Trans-Pacific Partnership. Mexico’s Senate voted 73-24 to approve the agreement which will go into effect when six of the 11 nations approve the deal. President Trump earlier this month directed U.S. Trade Representative Robert Lighthizer and National Economic Council Director Larry Kudlow to consider rejoining the TPP, but he later voiced his preference for a bilateral trade agreement with Japan rather than the TPP agreement. Meanwhile, Japan will visit with Thailand as Thailand hopes to join the new TPP, a move Japan predicts would pressure the United States to again consider rejoining the pact. The National Pork Producers Council points out that Japan is the top pork export market for the United States. Further, the Trans-Pacific Partnership was expected to add $4 billion worth of U.S. ag exports to the ag economy. The Environmental Protection Agency has granted an undisclosed waiver to CVR, a refinery owned by Carl Icahn (Eye’-kahn), allowing the company to bypass its biofuel obligations under the Renewable Fuel Standard. The move, which is one of several, has angered the ethanol industry. Growth Energy CEO Emily Skor points out the political ties between the Trump Administration and Icahn, as “Icahn interviewed Scott Pruitt for the job.” EPA administrator Pruitt told reporters last week that the EPA is following statute regarding RFS waivers. But, the move to grant a waiver to CVR means “Icahn stands to make millions more from an EPA handout,” according to Growth Energy. Icahn has been under the microscope since the beginnings of the Trump administration. While serving as an unpaid advisor to President Donald Trump, Icahn submitted a proposal to change the point of blending under the RFS away from refiners and further down the supply chain. The Governor of New York is demanding U.S. Immigration and Customs Enforcement, or ICE, stop some raids by the federal agency in his state. Andrew Cuomo has sent a cease and desist letter to ICE following a raid on a farm in New York without a warrant. Meat industry publication Meatingplace reports the governor signed an executive order to block ICE arrests in state facilities without a warrant, and to prohibit state agencies and law enforcement officers from inquiring about an individual’s immigration status unless required by law or to establish whether the individuals qualify for a specific benefit or service. The letter cited an April raid by undercover agents at a dairy farm in Rome, New York, where the owner reported agents were questioning a farm worker on the property and pushed him against a window as his children watched while waiting for a school bus. The federal agency has not yet responded to the letter. The U.S. Department of Agriculture Monday announced $7 million of funding support for specialty crop industries. The funding will support 11 projects in six states to “develop solutions to challenges” affecting specialty crop producers. The funding is managed through the Specialty Crop Multi-State Program and administered by the Agricultural Marketing Service. The 2018 funding will support partnership-based projects that, while originating in six states, are developed through multiple other states via universities. The program, according to USDA, helps strengthen food safety, while helping growers of specialty crops, including fruits, vegetables, tree nuts and horticulture crops, find new ways to address plant pests and diseases. Specific details of each project can be found online at www.ams.usda.gov. A survey of fleet vehicle providers has found that biodiesel is now the most popular alternative fuel option on the market, followed by E85. The National Biodiesel Board says the study conducted by the Association for the Work Truck Industry shows that the nation’s top fleets call biodiesel the number one choice for greening fleet operations. The 2018 Fleet Purchasing Outlook study shows that 75 percent of fleet respondents planning to acquire trucks in 2018 anticipate maintaining or increasing use of diesel engine powered trucks, and more fleets are planning to acquire or continue using biodiesel than any other alternative fuel option. Survey organizers note that Nearly 40 percent of respondents indicated they currently operate alternative-fueled trucks in their fleets, up four percent from 2017, and interest is at the highest recorded level since 2014.